The Naked Election premiered last night on RTE 1 and it seems to have gone down very well. I signed up for twitter yesterday and was watching the feedback from people during the ad breaks and after the show. The universal praise the show was getting has to be one of the highlights of my career in editing. It was totally surreal to be able to hear what all those people had to say, now if they hadn’t liked the show i’d say the experience could have been incredibly depressing. Thankfully that wasn’t the case and in fact #nakedelection was the number one trending item in Ireland for several hours last night and this morning. Honestly my mind was kind of blown from all the positive feedback and it was a great reward for all the hard work we put in last week. The picture above is the map of the episode I used to plan out the different scenes. 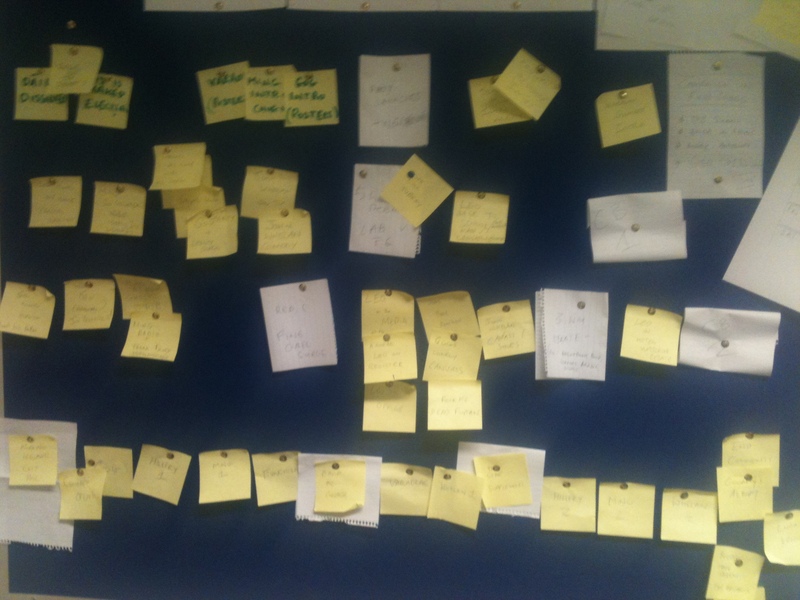 The yellow notes are candidate scenes and the white ones are national story points which we used to help with the timeline and as breathers between our candidates. I took the photo with my iphone so its probably hard to read, no harm there either as my handwriting is awful. After all that excitement, its onwards and upwards with Episode 3 of Mobs Canada tonight at ten on TG4. The story of John ‘Red’ Hamilton, an Irish-Canadian bank-robber who throughout the 1930’s acted as right hand man to the notorious John Dillinger. This story touches on the true story behind the movie Public Enemies. Really enjoyed the show John. Love the post its. Great to get an insight into the mind of an editor.